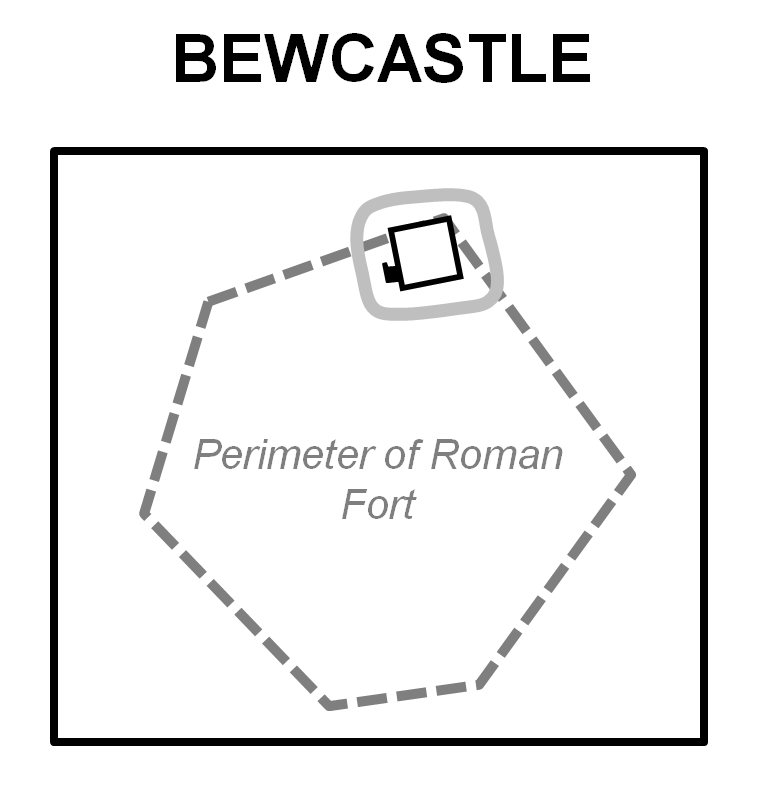 Occupying a strong defensive position on a hexagonal plateau, Bewcastle was occupied by the Romans who built an unusually shaped fort on the site possibly re-using an earlier defensive structure. Bewcastle Castle was constructed within the former Roman earthworks in the late eleventh century and remained garrisoned until 1641. The first known fortification at Bewcastle was a Roman Fort built around AD 122 concurrently with Hadrian's Wall, some six miles to the south. It is likely that the fort, which is believed to have been called Fanum Cocidi, formed an integrated part of that frontier. Initially an earth and timber structure, it was configured in an extremely unusual design. Normally the Romans built their forts in a ‘playing card’ shape with a standardised layout that had evolved from their marching camps. This was not the case at Bewcastle where the fort was a six sided structure with each wall a different length. The difference is almost certainly due to the terrain - Bewcastle was superbly sited on a hexagonal plateau and protected on all sides by steep, natural scarps. The Romans simply adapted their design to fit the ground although it must be emphasised this was very unconventional. In other forts where this has occurred, such as Whitley Castle, a more conservative approach was taken where the traditional four-sided layout was maintained but deformed to fit the ground. It is possible the site may have hosted an earlier fortification that may also have hosted the design of the Roman fort. Following the construction of the Hadrianic frontier, Bewcastle was clearly an important outpost. During the second century the greatest threat was deemed to be on the western side of the Wall from the Novantae and Selgovae tribes based in Dumfries and Galloway. Bewcastle would have been a key intelligence gathering site and was garrisoned by the First Cohort of Daci (Cohors I Dacorum) - a one thousand strong mixed cavalry/infantry auxiliary force recruited from Romania, Hungary and the Balkans. This large garrison was double the normal size of most auxiliary manned forts. The outpost was situated on the Maiden Way - a Roman road that connected the central sector of the frontier with the wider Roman network. The road passed through the Hadrianic frontier at Birdoswald Fort and then proceeded directly to Bewcastle. The frontier seems to have been relatively peaceful until the fourth century AD but then started to come under increasing pressure from the northern tribes which the Romans collectively referred to as the Picts, the painted people. Bewcastle was attacked in AD 342 and it may have been abandoned at this time. Further attacks were made on the frontier between AD 360-7 culminating in the so-called Barbarian conspiracy – a coordinated attacked by hostile forces from Ireland, Denmark and by the Picts. Britannia was overran and it was not until AD 369 that order was restored. In light of this it is possible the outpost fort at Bewcastle was no longer deemed viable. Even after the Roman withdrawal from Britain, the Maiden Way continued to be a major trade route and accordingly the ruins of Bewcastle fort continued in use after the Romans left. The Bewcastle cross, situated within the site of the old fort and allegedly the resting place of the Anglian King Alcfrith, suggests occupation/use well into the eighth century. It is believed the name Bewcastle derived from an eleventh century lord, Bueth, who sided with the Normans at the time of the conquest. Allegedly he built the first castle however some authors disagree and say the name is indicative of the military activities associated with the Romans. At some point in the medieval period a castle was constructed within the earthworks of the former Roman fort. Built in the northern corner of the earlier defences, the precise time of its construction is unknown. The first written record to the castle dates from 1378 but it is likely that a castle was built circa-1092 following the English annexation of the area from Scotland. If so it was probably one of the structures destroyed by William the Lion during his attacks of 1173/4. The remains seen today are generally believed to date between 1296 to 1307 in the wake of the instability during the First War of Scottish Independence. At this time the castle was owned by Adam de Swinburne who supported John Balliol resulting in Bewcastle briefly being confiscated by Edward I. Restored to his family, it later passed to John de Strivelyn. In 1401 the castle was seized by Scottish troops but was soon recaptured. Bewcastle was acquired by Richard, Duke of Gloucester in 1478 and was still owned by him when he became King in 1483 (as Richard III). By this time the structure consisted of a Shell Keep with a gatehouse in the west and surrounded by a moat. The structure was extensively re-modelled in the sixteenth century including the addition of a barbican. At this time the remoteness of the border region meant the area was plagued by lawlessness - particularly thieves and murderers known as Border Reivers. Bewcastle was used as a safe refuge by the local inhabitants during such attacks and in the reign of Elizabeth I (1558-1603) modifications were made to support a small cavalry force aimed at disrupting Reiver activity. The Union of the Crowns in 1603 led to a concerted effort to eliminate the Border Reivers although it would not be until the construction of the military roads in the eighteenth century that they would finally be brought under control. 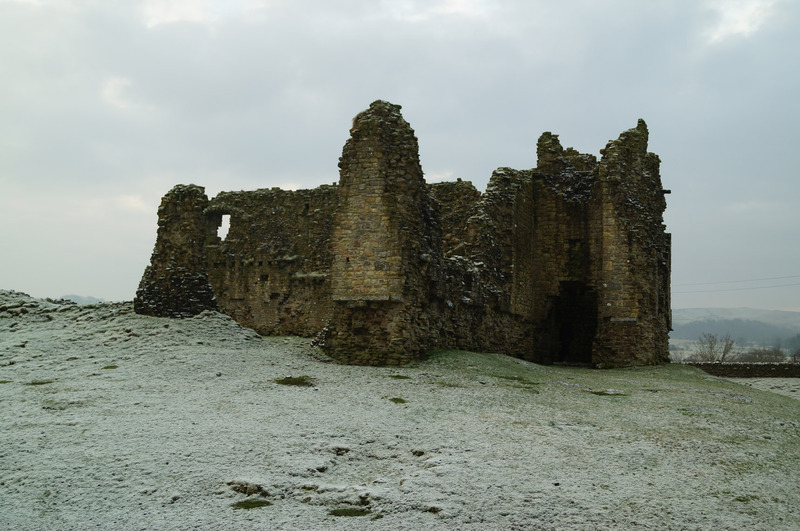 Despite using Bewcastle as a base, Elizabeth I had refused funding to maintain the structure and by the outbreak of the Wars of Three Kingdoms the castle was ruinous. Nevertheless the dilapidated structure was garrisoned in 1639 during the Bishops Wars. It continued to be occupied until 1641 when it was demolished by Parliament and the garrison removed to Carlisle. Creighton, O.H (2002). Castles and Landscapes: Power, Community and Fortification in Medieval England. Equinox, Bristol. Historic England (2016). Bewcastle Roman fort, high cross shaft in St Cuthbert's churchyard, and Bew Castle medieval shell keep castle. List entry 1015728. Historic England, Swindon. Jackson, M.J (1990). Castles of Cumbria. Carel Press, Carlisle. Perriam, D and Robinson, J (1998). The Medieval Fortified Buildings of Cumbria. Kendal. Thompson, M.W (1987). The Decline of the Castle. London. 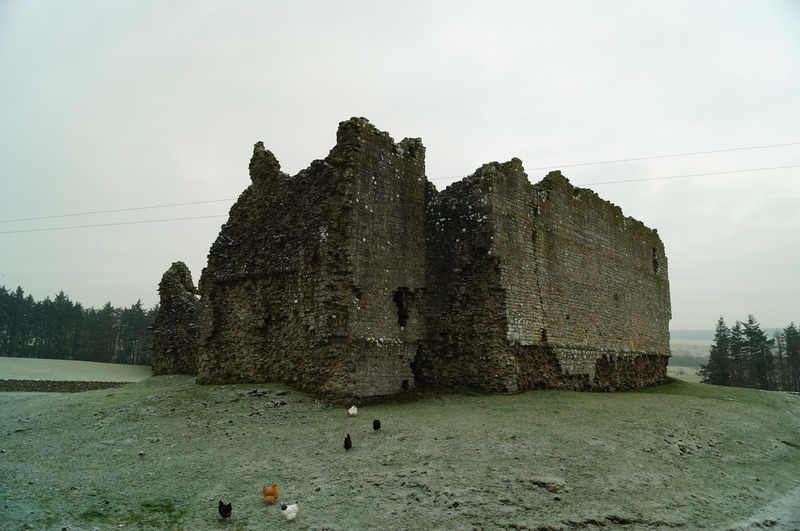 Bewcastle Castle consists of the ruinous remains of a medieval castle located within slight earthworks of a former Roman Fort. Just to the north of Hadrian’s Wall the castle is just a short drive away from some of the other attractions on that tourist route and is well worth a detour. A sign at the site states access is allowed from “9am during daylight hours”. Medieval Shell Keep. The medieval castle consisted of a square shell Keep with a gatehouse in the west. 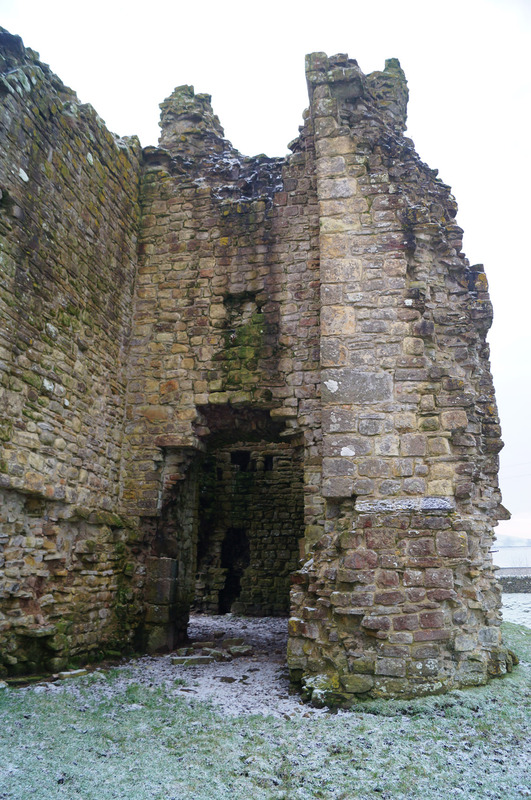 As can be seen above, the gatehouse survives as does a portion of the curtain wall. Bewcastle Layout. The unusual shape of the Roman fort was dictated by the hexagonal plateau on which the castle was built. Bewcastle is found to the north of Brampton off the B6318. The castle ruins are on private land but access is allowed during daylight hours. There is no dedicated parking on the site but on-road parking in the vicinity is possible.